Fortunately the short-eared owl is not in quite the predicament that the gorillas of Central Africa are – but that didn’t stop this bunch from doing their thing in the mist. I had spent all morning looking for them in quite decent light, had given up and was driving home when a friend called to say that an owl had been spotted flying… Turned the little car around to find not one but five (maybe six) of the elusive critters foraging, air-wrestling and generally having a good time – but by now the fog had come in off the sea, and the light had all but gone. These images are the best of a mediocre lot, but I was very happy to take them with me home all the same. 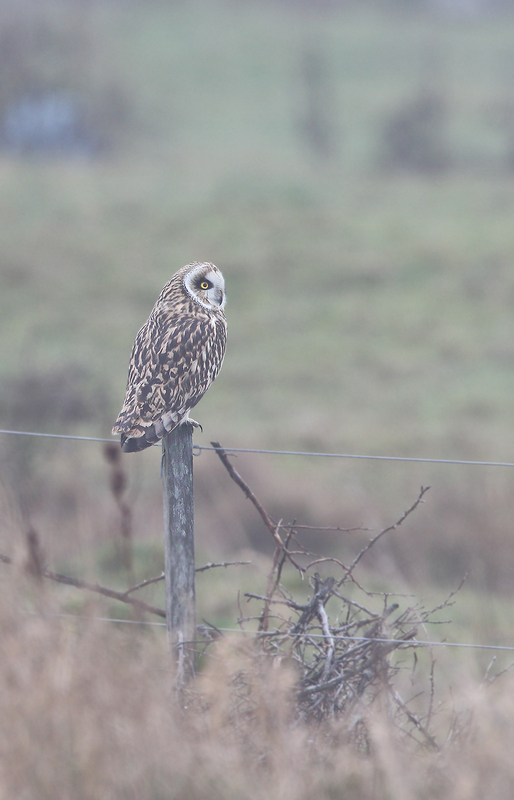 I hope I get another chance before the owls are off to Norway and Sweden for their breeding seasons again. The background does get rather attractive in foggy weather – but the lack of light means high ISO settings and blurred wingtips. Awesome shape for a bird – like a barrel with wings.